Chairman Kelvin Thomas says new boss Keith Curle is ‘exactly’ the manager the club needs, and believes he has the experience required to haul the Cobblers away from the lower reaches of Sky Bet League Two. Less than 24 hours after the sacking of Dean Austin, Town have moved very quickly to bring in their new man, and Curle has started work immediately. The former England defender has already met the players and staff at the club, and will take charge of Tuesday night’s league two date with Bury at the PTS Academy Stadium. Curle has a proven track record in the basement division of the Football League, taking Mansfield Town to the play-off final in 2004. 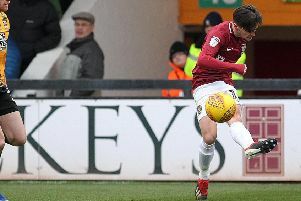 They saw off Colin Calderwood’s Cobblers at the semi-final stage, before losing on penalties to Huddersfield Town in the final at the Millennium Stadium. Curle had unsuccessful spells at Chester City and Torquay United, before impressing again with both Notts County and Carlisle United, and it was the job he did with the Cumbrians that particularly impressed Thomas. “In the position we are in we think we needed a manager with a lot of experience of league two and Keith has that,” said the Town chairman. “He has managed around 400 games at this level and we think he is exactly who we need right now. “He took over at Carlisle United in similar circumstances and did an excellent job, not only steering them out of trouble but developing a squad that was able to challenge for promotion in the following seasons. Thomas and Town have wasted no time in making the appointment, and the chairman revealed Curle and his assistant Colin West simply couldn’t wait to get started. “We were keen to move quickly and after discussions and finalising paperwork today, Keith and Colin have met the players and staff,” he said. “They were determined to take charge of the team for the game on Tuesday night to try and have an impact rather than just have a watching brief. “We have the talent within the squad at the club and we need someone who can help them turn in the performances required to secure results. “As always, it’s going to be a tough job, but Keith and Colin are up for the challenge and want to hit the ground running.